Software makes ultra use of latest technologies. The advanced and competent techniques collaborate together in making data migration quick and apt. The software is highly helpful to be used. It is apt to use utility for converting emails, email properties and metadata info altogether. Thus connect with the software and seek smooth conversion methods. The application is ultimately safe to work with. Do not worry for data loss like undue scenarios. Simply buy the application and start with the commencement of EML to MBOX migration. You will be able to collect lots of ease and benefits ahead due to safe export of emails from an end into another. Whenever you want to bulk data migration from EML files into MBOX then this application is worth to purchase. Just connect with the software and let the conversion be the best experience. Even when you have bulk to be moved into MBOX file format then also this tool is best to be utilized. The application is supportive of working with all EML files created using any of the email clients such as Windows Live Mail, Thunderbird, and Outlook etc. Data migration is genuinely safe and comfortable process to work with. You can convert mailbox data and other data safely into MBOX file format. Data safety is always maintained and kept on priority basis amongst software developers. The process of conversion solution is completely dependent on accuracy with us. This is why all the folders remain as it is. Folder hierarchy is fully maintained which help you ahead on several occasions. You can use the application with ease without bothering about specific Windows versions. Hopefully, you will come across long lasting flexibility so connect with the application and earn immense of the benefits ahead. Do you have large sized EML files for conversion? In this connection, you hardly need to get worried at all. Just connect with the software and make safe data export from EML file format into MBOX files. Download Now button need to be clicked and this will remove all the apprehensions you are facing with conversion of data from EML into MBOX. By downloading the application in free demo version, you will be able to access complete process to migrate data from EML into MBOX. Is there any file size limitation with EML to MBOX Converter? There is no file size limits with the application. You can run the tool even you have large sized EML file. Thus not to worry at all. Does the software work with all Windows platforms? Yes, this application is consisted of all important Windows OS editions. No troubles which edition you are using thus any of the Windows versions is fully workable with the application. This will add flexibility on your part as well. What does the license version offers? Software is filled with various premium set of features. By testing the application in demo, test all of them carefully. Fortunately, the application is comprises of fast running conversion benefits, quick search for EML files, simple functionalities and so on. How the software works with large size EML files? If you have large sized EML files for converting into MBOX then do not worry, as application is supportive of large sized EML file migration too. Thus connect with the application and seek the ease in converting EML files into MBOX. You will be able to diagnose the complete functioning of the software prior making purchase formality. What can I get with the free version of the tool? If you are in need to know all about the demo version of the application then simply click Download Now button and make out what software has to offer you. Free demo will show the process and working steps. 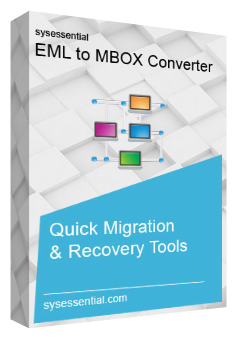 You will catch the features and know get access to conversion of first 10 emails from EML files into MBOX. Thus free demo is really helpful in the long run. For cost related details of Sysessential for EML to MBOX Converter then you are recommended for using customer care services. You will be able to collect all details connected with the product and other info as well. If you have some product related queries, then also customer care team will help you. Hi, I wanted to experience my share with you when I got into quickest need for converting EML files into MBOX file format. I tried manual method which made me tired but on my friend’s suggestion, I invested in Sysessential for EML to MBOX Converter which yielded best results. I found all the emails safely into MBOX file format without affecting data integrity at all. I still remember the bad time I experienced with one of the non-performing email conversion application which I used for converting EML files into MBOX. Then I concluded for Sysessential for EML to MBOX Converter which migrated all the emails from EML file format into MBOX files. It made all the data converted into MBOX files in a safe and effective way.